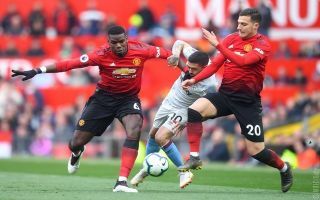 Manchester United headed into halftime of their clash against West Ham with a 1-0 lead, the Red Devils need to pick up their form after winning just one out of their last five games. Ole Gunnar Solskjaer’s side weren’t too convincing in the first-half against the Hammers, they benefited from two strokes of luck in the opening 45 minutes. West Ham had the ball in the net in the opening ten minutes of the clash, but Felipe Anderson’s strike was controversially ruled out for being offside. Less than ten minutes after their lucky escape, the Red Devils won a penalty in the 17th minute after Robert Snodgrass tackled Juan Mata in the box. Paul Pogba stepped up and smashed the ball down the middle of the goal to give Solskjaer’s men the lead. Despite Anthony Martial and Juan Mata both being involved in the buildup to the penalty, the pair struggled to show their cutting edge in the first-half of proceedings. I have always loved mata. But now he is running like a snail.! With all due respect to his creativity, he is too slow. Sorry that he needs to go. About jones and smalling – I have no words! Even his final ball has gone. This team doesn’t deserve Top Four. Martial has had a shocker, poor game,poor decision making. Always getting away with out criticism. We have been absolutely awful. Defensively all over the place. Barely anything going forward. Juan Mata is finished. Martial also been terrible. What is this half? Just so poor in my eyes. So many wrong passes from Martial and he’s so lazy in defense. And Lingard is invisible. He absutely did nothing in this game. Mata has become slow no… Martial n lingard both r not able to finish on counterattacks..
United need to come away with a win today, in order to improve their chances of finishing in the top four. A win against the Hammers will do them a world of good, the side will be able to carry this momentum into their mammoth clash against Barcelona on Tuesday evening.